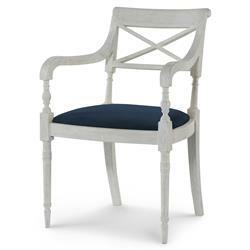 Bring a revival of style and spirit to your dining room with this neoclassical armchair. Century-old inspired carvings construct an elegant frame and the white-weathered oak tones down any hint of pretentiousness. Harbour blue velvet brings a welcome pop of color, perfect in any country or coastal interior.